In silver, the total open interest ROSE BY A HUGE 2936 contract(s) UP to 209,689 WITH THE HEALTHY RISE IN PRICE THAT SILVER TOOK WITH YESTERDAY’S TRADING (UP 16 CENT(S).TODAY WE HAD NEW SPECULATOR LONGS ENTER THE MARKET WITH THE BANKERS SUPPLING THE NECESSARY PAPER. THE BANKERS ARE HAVING AN AWFUL TIME TRYING TO SHAKE THE SILVER LEAVES FROM THE SILVER TREE. In ounces, the OI is still represented by just OVER 1 BILLION oz i.e. 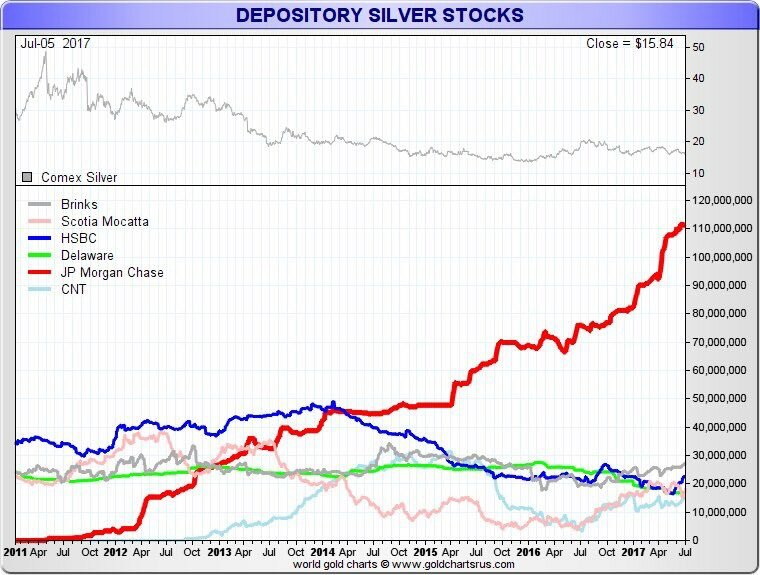 1.049 BILLION TO BE EXACT or 150% of annual global silver production (ex Russia & ex China). In gold, the total comex gold FELL BY 1662 CONTRACTS DESPITE THE RISE IN THE PRICE OF GOLD ($7.50 with YESTERDAY’S TRADING). The total gold OI stands at 484,204 contracts. THE BANKERS ARE STILL LOATHE TO SUPPLY THE GOLD PAPER AND WISH TO COVER MORE OF THEIR SHORTS. SOME NEWBIE SPEC LONGS STARTED TO ENTER THE GOLD COMEX ARENA AGAIN. THE PLETHORA OF DATA RELEASED ON FRIDAY SHOWING RETAIL SPENDING BASICALLY COLLAPSING ALONG WITH SMALLER INFLATION NUMBERS MUST BE SCARING OUR BANKERS TO DEATH. 1. Today, we had the open interest in silver ROSE BY A HUGE 2936 contracts UP TO 209,689 (AND now A LITTLE CLOSER TO THE NEW COMEX RECORD SET ON FRIDAY/APRIL 21/2017 AT 234,787), DESPITE THE RISE IN PRICE FOR SILVER WITH RESPECT TO YESTERDAY’S TRADING (UP 16 CENTS ). JUDGING FROM WHAT HAPPENED IN GOLD, OUR BANKERS TRIED TO COVER THEIR SHORTS TO NO AVAIL. THE LONGS STOOD STOIC AND AGAIN ENTERED THE ARENA TAKING ON THE BANKERS AND IT SEEMS THAT SHORTS (BOTH NEWBIE SPECS AND BANKERS) ARE TRAPPED AND CANNOT GET OUT OF THEIR MESS. v)The CBO states that the government has until mid October to raise the debt ceiling. The total gold comex open interest FELL BY 1662 CONTRACTS DOWN to an OI level of 484,204 DESPITE THE RISE IN THE PRICE OF GOLD ($7.50 with YESTERDAY’S trading). We must have had some bankers cover their shorts with the combination of newbie specs entering the comex casino. The non active July contract LOST 3 contract(s) to stand at 37 contracts. We had only 4 notices filed YESTERDAY morning, so we GAINED 1 contracts or an additional 100 oz will stand in this non active month of July. Thus 0 EFP notice(s) was given which gives the long holder a fiat bonus plus a futures contract for delivery and most likely these are London based forwards. The contracts are private so we do not get to see all the particulars. The next big active month is August and here the OI LOST 15,261 contracts DOWN to 208,396, as this month winds down prior to first day notice. The next non active contract month is September and here they GAINED another 187 contracts to stand at 820. The next active delivery month is October and here we gained 906 contracts up to 24,130. October is the poorest of the active gold delivery months as most players move right to December. On July 19.2016: open interest for the front month: 306,757 contracts compared to July 19.2017: 207,458. And now for the wild silver comex results. Total silver OI ROSE BY A huge 2936 contracts FROM 206,753 up to 209,689 with YESTERDAY’S STRONG 16 CENT GAIN (AND DESPITE CONSTANT TORMENT THESE PAST FEW WEEKS). OUR BANKER FRIENDS ARE DESPERATELY TRYING TO COVER THEIR SHORTS IN SILVER BUT AS YOU CAN SEE THEY HAVE NOT BEEN AS SUCCESSFUL AS THEY WOULD HAVE LIKED. THE SPECULATORS WERE ALSO TRYING TO COVER THEIR SHORTS ALONG WITH THE BANKERS AND THIS PROPELLED SILVER NORTHBOUND IN PRICE AGAIN. THE COMMERCIALS AGAIN SUPPLIED THE NECESSARY NEW SHORT PAPER. THE BANKERS WERE TOTALLY SHOCKED WITH THE DATA RELEASED ON FRIDAY (RETAIL SALES/SPENDING/SMALL INFLATION) WITH HAS PROPELLED OUR PRECIOUS METAL PRICES NORTHBOUND..THE BANKERS HAD NO CHOICE BUT TO SUPPLY NEW SHORT SILVER PAPER. We are now in the next big active month will be July and here the OI GAINED 25 contracts UP to 163. We had 24 notices served yesterday so we gained 49 notices or an additional 245,000 oz will stand at the comex, and 0 EFP contracts were issued which entitles them to receive a fiat bonus and a future delivery contract (which no doubt is a London based forward). The month of August, a non active month LOST 45 contracts to stand at 409. The next big active delivery month for silver will be September and here the OI GAINED ANOTHER 1659 contracts UP to 155,034.
amt standing tonight: 15.265 million oz. Today, 0 notice(s) were issued from JPMorgan dealer account and 0 notices were issued from their client or customer account. The total of all issuance by all participants equates to 25 contract(s) of which 0 notices were stopped (received) by j.P. Morgan dealer and 0 notice(s) was (were) stopped/ Received) by j.P.Morgan customer account. To calculate the initial total number of gold ounces standing for the JULY. contract month, we take the total number of notices filed so far for the month (149) x 100 oz or 14,900 oz, to which we add the difference between the open interest for the front month of JUNE (37 contracts) minus the number of notices served upon today (25) x 100 oz per contract equals 16,100 oz, the number of ounces standing in this NON active month of JULY. We GAINED 1 contracts or AN ADDITIONAL 100 oz will stand and 0 EFP contract(s) was issued as described as above. Thus the INITIAL standings for silver for the JULY contract month: 2922 (notices served so far)x 5000 oz + OI for front month of JULY. (163 ) -number of notices served upon today (32)x 5000 oz equals 15,265,000 oz of silver standing for the JULY contract month. YESTERDAY’S CONFIRMED VOLUME OF 96,457 CONTRACTS EQUATES TO 482 MILLION OZ OF SILVER OR 69% OF ANNUAL GLOBAL PRODUCTION OF SILVER EX CHINA EX RUSSIA). IN OUR HEARINGS THE COMMISSIONERS STRESSED THAT THE OPEN INTEREST SHOULD BE AROUND 3% OF THE MARKET. 1. Central Fund of Canada: traded at Negative 6.5 percent to NAV usa funds and Negative 6.5% to NAV for Cdn funds!!!! Note: Sprott silver trust back into POSITIVE territory at +0.70/Sprott physical gold trust is back into NEGATIVE/ territory at -0.69%/Central fund of Canada’s is still in jail but being rescued by Sprott. *LAST 132 TRADING DAYS: A NET 3.57 TONNES HAVE NOW BEEN WITHDRAWN FROM GLD INVENTORY. *FROM FEB 1/2017: A NET 9.52 TONNES HAVE BEEN ADDED. 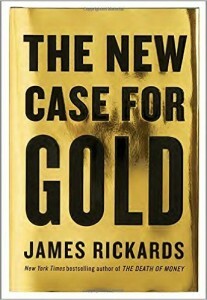 In an timely piece, Rickards points out how the Federal Reserve is behind the curve, has “theories that bear no relation to reality” and has “blundered by raising rates.” This is happening at a time when the U.S. economy and stock markets are very vulnerable. Rickards warns that growth in the U.S. remains weak, as are inflation, retail sales and real incomes. Tighter money in a weak economy with a stock market bubble is a classic recipe for stock market crash. “It’s time for investors to go into a defensive crouch by selling stocks and reallocating assets to cash, Treasury notes, gold and gold mining shares. HONG KONG — China is considering a merger between China Minmetals Corp, one of the country’s largest miners and metals traders, and China National Gold Group, as Beijing pushes consolidation of its state-run firms, sources with knowledge of the matter said. Three sources with knowledge of the discussions said the two state-owned firms have been in negotiations for months, though any agreement could still be some time away. 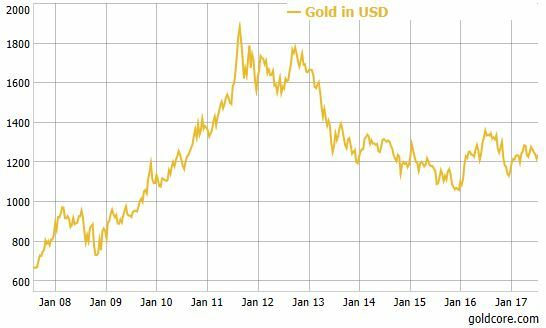 Gold is one of the most unusual investments that anyone can make. It does not pay dividends, it does not produce earnings, and it does not make promises about growth prospects — like most firms do. But it does deliver returns, outperforming property and the FTSE 100 Index over the past 10 years. If someone had put L1,000 into the FTSE in 2007, for example, it would be worth L1,640 today, while the same amount invested in 20-year gilts would be worth L1,350, or L1,190 if the cash had been ploughed into UK property. JPMorganChase & Co. seems to have gotten out of the Comex gold and silver markets in recent weeks, after accumulating huge stocks of both monetary metals, the TF Metals Report asserts today. The TF Metals Report wonders if this change has resulted from the U.S. Commodity Futures Trading Commission’s starting to enforce position limit rules against the bank, or if the bank has decided that it now has enough gold and silver to allow their prices to rise. — it may be fair to suspect that the firm’s clients in the monetary metals market include the U.S. government and other governments and central banks. Or maybe the bank’s metal stockpiles have been amassed on behalf of one government client for delivery to another government. Unfortunately no one in the mainstream financial news media dares to raise such obvious questions. Gold researcher Ronan Manly today explains how the New York Commodities Exchange’s futures market in gold, the Comex, is designed to separate gold’s nominal price from actual metal and to facilitate manipulation of the market by its biggest participants. Manly concludes: “As the Comex pursues its record-breaking attempt in 2017 to trade gold futures representing more than 200,000 tonnes of gold, the disconnect between the Comex and the real world is becoming all too clear. Comex flash crashes will continue as long as the CME Group [owner of the Comex] and U.S. Commodity Futures Trading Commission let them continue. And many people will continue to believe that these flash crashes were deliberately orchestrated. Two days ago we saw the first ICO fraud exposed (as CoinDash was hacked), and after a big rebound the last two days (as civil war seems to have been peacefully resolved with 80% of hashers reportedly accepting SegWit), Ether is suddenly crashing again as several tweets mention more (and larger) ICO hacks. Bitcoin has reached/so far held notable support at 1,857-1,789. The area includes an ABC equality target off the June high as well as the 100-dma. The 100-dma has been particularly reliable in holding pullbacks since the late-’15 lows. Moreover, due the corrective nature of the pullback, this ABC target seems like a reasonable place to watch for signs of a turn. Additionally, daily momentum is nearing similar levels to where they previously based in March. All in all, the balance of signals appear to be shifting to a more positive tone. From a wave count perspective, this entire retracement can be viewed as a counter-trend 4th wave in a V-wave advance that started in ’11. From this perspective, it’s either completed a full ABC or only the first A leg of a 3-3-3 type correction. Either way, this 1,856-1,790 area has potential to act as strong support. The first level to note above is gap resistance at 2,159. 3b Japan 10 year bond yield: RISES TO +.075%/ GOVERNMENT INTERVENTION !!!! (Japan buying 100% of bond issuance)/Japanese yen vs usa cross now at 114.34/ THIS IS TROUBLESOME AS BANK OF JAPAN IS RUNNING OUT OF BONDS TO BUY./JAPAN 10 YR YIELD FINALLY IN THE POSITIVE/BANK OF JAPAN LOSING CONTROL OF THEIR YIELD CURVE AS THEY PURCHASE ALL BONDS TO GET TO ZERO RATE!! 3j Greek 10 year bond yield RISES to : 5.27??? 30 SNB (Swiss National Bank) still intervening again in the markets driving down the SF. It is not working: USA/SF this morning 0.9543 as the Swiss Franc is still rising against most currencies. Euro vs SF is 1.0999 well above the floor set by the Swiss Finance Minister. Thomas Jordan, chief of the Swiss National Bank continues to purchase euros trying to lower value of the Swiss Franc. In what has been a less exciting session than the previous two, the euro retraced some recent gains as traders grew concerned they may have overestimated the ECB’s hawkish bias ahead of Thursday’s rate decision; in turn the dollar edged higher after the collapse of the GOP healthcare bill sent it to the lowest since September on Tuesday. In Dante’s inferno, Purgatorio immediately precedes Paradiso. Fingers’ firmly crossed. European equities got a boost from both the weaker euro and from corporate results, while oil fluctuated and gold fell. The Stoxx Europe 600 gained 0.3% in early trading after falling 1.1% Tuesday, its largest drop this month as concerns emerged that the stronger Euro would pressure exporters, leading to the first decoupling between the EURUSD and the Stoxx in two months. S&P 500 futures were little changed (up 0.05%) after the cash index closed at another record on Tuesday. With the USD just off 10-month lows, there continues to be an easing of loosening of financial conditions for emerging markets which also supports equities. After decent gains in Asia on the back of positive signs from China this week, MSCI’s world stocks index looked set for a ninth day of gains which would mark its longest winning streak since October 2015. In Asia, MSCI’s index of Asia-Pacific shares outside Japan and its index of emerging market shares were both up 0.5 percent at their highest since April 2015. China’s Monday fireworks were long forgotten, with the CSI 300 index leading winners as mainland stocks rallied sending the Shanghai Composite and ChiNext higher by 1.4% and 1% respectively. Hong Kong’s Hang Seng Index was up 0.6 percent. Japan’s Topix Index swung between gains and losses, while South Korea’s Kospi Index rose 0.2 percent. The Yuan weakened for first time in eight days despite strongest daily fixing since October; seven-day repo falls five basis points after PBOC injects 100 billion yuan of liquidity. Following Tuesday’s unexpectedly hawkish RBA announcement, Australian bonds were firmer with the 10-year yield dropping 3 bps. Australia’s S&P/ASX 200 Index rose 0.8 percent as bank shares climbed. Analysts said new capital requirements looked fairly benign. The U.S. dollar, which dropped sharply on Tuesday after the collapse of the GOP healthcare bill, managed a modest rebound on Wednesday. Against a basket of other major currencies, it was up 0.3 percent at 94.878, but still down around 7 percent on the year and within sight of Tuesday’s low of 94.476. The modest USD gains were due to expectations the European Central Bank and the Bank of Japan may strike dovish tones when they meet on Thursday which could dent recent strength in the euro and the Japanese Yen. Meanwhile, the bearish pileup continues, with hedge funds most bearish on the dollar since 2013. On Thursday, the ECB is expected to adjust their language but substantive changes to their policy will likely come later in the year. The BOJ is expected to raise its growth forecast but cut its inflation outlook, underlining the cautious tone adopted recently by major central banks. Emerging-market stocks climbed for an eighth-straight day to the highest since April 2015, lifted by strong finish for Chinese equities, iron ore futures also +3.7%, helping AUD and NZD marginally outperform with domestic equity markets. MXN initially rallies after S&P raises country’s outlook. Treasuries pare rally with longer maturities leading declines; 10-year yield +1bp to 2.27%. USD swap spreads are edging wider across the curve, led by 10-year sector as swapped issuance is expected to dry up after the latest wave of financial issuance pricings, tempting fast-money dip buyers. Open interest points to liquidations of longs in 10-year futures into Tuesday’s rally. In commodities, WTI crude fluctuated before slipping 0.2 percent to $46.29 a barrel after API reported an unexpected rise in inventories on Tuesday; today’s DOE number will be closely watched. Gold dropped 0.3 percent to $1,238.74 an ounce. Iron ore futures jumped 2.6 percent, building on a 7 percent advance over Monday and Tuesday. Quiet thus far in Europe with EU bourses trading with marginal gains. EUR loses its shine amid slight profit taking ahead of tomorrow’s ECB meeting. Asian stocks traded mixed, following a similar lead in the US where Goldman Sachs’ quarterly revenue weighed on the DJIA, while Netflix led the NASDAQ 100 into positive territory following its beat on earnings. ASX 200 (+0.6%) finished positive, with the financial sector providing the support, whilst Nikkei 225 (+0.1%) was choppy amid a lack of news flow and tier-1 data releases to provide a catalyst. Elsewhere, Shanghai Comp. (+0.9%) and Hang Seng (+0.5%) traded in an upbeat fashion, gaining influence from the CNY 140b1n liquidity injection by the PBoC. Finally, 10yr JGBs were flat with some underperformance seen in the long end, while the JGB auction for enhanced liquidity auction added no direction for the market. PBoC set CNY mid-point at 6.7451 PBoC injected CNY 100bln via 7-day reverse repos and CNY 40bln in 14-day reverse repos. In Europen bourses, the week’s subdued summer trade continues, with equities trading in marginal green territory in what has been a fairly quiet session thus far. Nonetheless, notable moves has been seen in the Scandi stocks with the likes of Volvo, Swedbank and Assa Abloy all reporting before the European open. Across fixed income markets, German yields have been slipping with the curve slightly steeper, while the move had been exacerbated by a firm 30year auction. Elsewhere, gilts climbed higher after strong demand for the new 5 year gilt at today’s auction. London’s Home Price Growth Has Flatlined. What Happens Next? In currencies, the AUD has continued to grind higher in Asia to further pull away from 0.79, extending on its post RBA gains, while sentiment has also been boosted by rising iron ore prices. Subsequently, this has further supported AUDNZD which is now hovering around 1.0750. Focus will be on the Australian jobs data tonight, while later in the week RBA speakers could look to tame the upside in AUD. EUR slightly pulled off the mid-1.15 with the rally likely to hold until the ECB monetary policy decision tomorrow. A move to 1.16 looks to be on the card unless Draghi deviates from his recent hawkish comments made at the Sintra conference. JPY holding just north of 112.00 after making a slight breach of that level, however support from 111.80 kept USD/JPY afloat. Of note, the BoJ announce their latest decision on monetary policy tonight, with the general consensus that the central bank will maintain its monetary policy and YCC, while they are also expected to lift growth forecasts and cut inflation targets. In commodities, Slight recovery in the USD has pressured the commodity complex with Gold prices slipping slightly. Crude prices trickling lower following last night’s API crude report which showed a 1.6m1n build in inventories. Looking at the day ahead, the UK and Europe will be fairly quiet. The US will release data on housing starts for June (est: 1,160k), building permits (est: 1,201K) and MBA mortgage applications. Away from the data, the inaugural meeting of the US-China Comprehensive Economic Dialogue will take place in Washington to discuss economic and trade issues which should be worth a watch. US earnings seasons remains a focus too, with Morgan Stanley, AMEX, Reynolds American and Qualcomm schedule to report. We might be inching closer to the dog days of summer but there has still been a steady slate of interesting newsflow for markets to feed off this week. Indeed the last 24 hours has had a bit of everything with data, politics and earnings all in vogue. Softer than expected inflation in the UK, further disappointment with the latest US healthcare bill developments – albeit where expectations were hardly high in the first place – and a fairly mixed read-through from the latest US bank earnings all had a say in markets one way or another yesterday. After trading a little firmer leading into the data, Sterling tumbled as much as -0.90% from its highs although only ended the day a shade weaker (-0.11%) after Governor Carney added later in the session that the data doesn’t change the outlook that price gains will remain above target “for a period of time”. Gilt yields were also sharply lower and stayed so into the close. 10y Gilt yields ended the day down 6.4bps at 1.207% and are now down over 10bps in the first two days of this week so far. Other European bond markets were stronger too with Bunds down 2.9bps to 0.547% and the periphery 5bps to 6bps lower. An ECB story was also doing the rounds on Bloomberg suggesting that the Bank is examining scenarios for the future path of QE including the studying of a tapering path, asset purchase extension and reduced pace and combination of the two strategies. That didn’t seem to suggest any new information however and was subsequently downplayed. Across the pond Treasuries were also well bid (10y -5.5bps to 2.260%) from the off yesterday as the market digested the latest setback in the healthcare bill debacle. After a replacement of the Obamacare bill was ruled out due to a lack of Republican support, it was revealed that a subsequent repeal also lacked the sufficient support. Senate majority leader Mitch McConnell announced that a procedural vote will still be held next week regardless. President Trump had plenty to say but it’s looking more likely that the administration will be moving on to tax reform and infrastructure now, however it remains to be seen how damaging the internal conflicts have been on the outlook for some of the more market-sensitive policies to pass. The USD index fell another -0.55% and is down four sessions in a row to the lowest since August last year. In fairness the healthcare bill headlines didn’t have a huge impact on risk assets in the US. The initial leg lower for the S&P 500 (which was down as much as -0.35%) appeared to have more to do with the latest earnings reports out of Goldman Sachs and BofA. While both banks reported beats at both the earnings and revenue lines the market picked up on some of the softer finer details of the report. In the case of Goldman’s there was a disappointing read-through from some of the core businesses and particularly FICC. The US bank sector closed down -0.39% and lower for the third session in a row however the broader S&P 500 managed to claw back to a small +0.06% gain and with it, yet another record high. A big boost from Netflix post results on Monday evening saw the Nasdaq turn in a +0.47% gain and so joining the S&P again at a new record high. In fact after falling to a two month low back on July 6th, the index has now turned in a positive session every day since (8 sessions) which is the longest such winning streak since February 2015. Another eye opening stat is that the S&P 500 has now gone 267 days without a 5% correction – the longest such streak since 1996. For completeness European equity markets (Stoxx 600 -1.11%) suffered their weakest day this month largely as a result of the stronger Euro (+0.66%) and some earnings releases. This morning in Asia, most key bourses are slightly up, with the Nikkei (+0.11%), Hang Seng (+0.41%) and the three Chinese bourses (+0.70% to +1.09%) paring back losses in recent days. The ASX200 strengthened +0.67%, supported by the banks (+~3%), which received a broadly benign regulatory outcome on target capital levels. US equity index futures are also a smidgen firmer, while bond markets in Asia have largely followed the lead from Wall Street and Europe in rallying overnight. Staying with the ECB, yesterday’s Q2 ECB bank lending survey showed a net easing in credit standards for corporates as well as a strengthening in loan and CAPEX demand. On a forward basis, the survey suggests banks in Germany and Netherlands expect more easing in credit conditions, while Italian banks expect a net tightening. Loan demand is expected to strengthen further, in both corporates and consumer loans, but slightly lower in mortgages. 2Q17 demand for fixed investment by corporates increased in the Euro area, particularly in Italy, Netherlands and Germany. Before we look at today’s calendar, wrapping up the remaining data from yesterday, in the US the NAHB housing index fell 2pts to 64 in July. Whilst still at a high level, the index is down 7pts from the March peak and is at its lowest level since November 16. Over in Germany, the ZEW survey for July was slightly down to 86.4, suggesting little changes over the past month in analysts’ assessment of current conditions or the economic outlook for the German and wider broader euro area economies. Looking at the day ahead now, the UK and Europe will be fairly quiet. Across the Atlantic, the US will release data on housing starts for June (est: 1,160k), building permits (est: 1,201K) and MBA mortgage applications. Away from the data, the inaugural meeting of the US-China Comprehensive Economic Dialogue will take place in Washington to discuss economic and trade issues which should be worth a watch. US earnings seasons remains a focus too, with Morgan Stanley, AMEX, Reynolds American and Qualcomm schedule to report. North Korea imports all the oil and oil products it consumes – mostly from China – and a prolonged suspension by CNPC would choke out supplies at a time when the international community is increasing pressure on North Korea to stop its nuclear and missile ambitions, and is intensifying checks over Chinese business relations with Pyongyang. According to a Reuters analysis of data by the Daily NK website – which is run by North Korean defectors who collect price data via phone calls with fuel traders in North Korea – private dealers in the north were selling gasoline at US$2.18 per kilogram, or US$2.92 per liter, as of July 5, a 50-percent surge compared to US$1.46 per kg on June 21. Gasoline prices fell slightly to US$2.05 per kg by July 12, but still, they were more than double compared to prices at the beginning of the year, Reuters’ analysis of the data shows. Diesel prices jumped by 20 percent in the three weeks to July 12.After the initial price surges in early July, prices of both diesel and gasoline have stabilized, probably because North Korea has encouraged fuel smuggling across the Chinese border, according to defector Kang Mi-jin who is in communication with traders in North Korea. China said in February that it was suspending until the end of this year all imports of coal from North Korea as part of its effort to implement United Nations Security Council sanctions aimed at stopping the country’s nuclear weapons and ballistic-missile program. In April, gas prices in North Korea jumped on reports that China may be mulling an oil embargo. The Bank of Japan is finally acknowledging something that Federal Reserve policy makers like San Francisco Fed President John Williams acknowledged months ago, when he published a paper highlighting the growing disconnect between the tightening labor market and consumer prices. As Credit Suisse strategist Burkhard Varnholt explained two months ago, the growing heft of e-commerce companies like Amazon represents a new disinflationary paradigm, weighing on the costs of consumer goods. Meanwhile, the intensifying three-way battle between Amazon, its chief brick-and-mortar rival Wal-Mart and discount grocers like Aldi have helped keep consumer prices anchored, while rent, tuition and medical costs have continued racing higher. And now that the company is preparing to take over Whole Foods Market, fire the grocers’ human employees and replace them with kiosks and sensors, allowing customers to walk out of the store with their items without waiting in a checkout line, the disinflationary trend is expected to continue. In fact, as the Washington-based e-commerce giant expands aggressively in other major developed and emerging economies, price pressures are expected to abate as the Bezos behemoth tightens the screws on its rivals. Prime Minister Shinzo Abe was elected in 2012, promising to revive Japan’s stagnant economy by pushing unprecedented monetary loosening. The BOJ’s QQE program has been buying bonds and stocks while lowering interest rates to record lows. Unfortunately for Abe, Japanese retailers have been cutting prices in response to the rise of online rivals like Amazon.com Inc., disrupting what had seemed like perfect conditions for Japan to get the stable dose of inflation it has long been looking for, according to WSJ. This reflects continued resistance to price rises, despite Japan’s longest economic expansion in 11 years and its tightest labor market in decades. The Bank of Japan is also likely to raise its view on the economy while keeping its policy settings on hold, the people said. “Japan isn’t alone in its surprise at the slow response of prices to improved economic strength. Policy makers, economists and central bankers in the U.S. and Europe are also scratching their heads about why prices around the world can move so little while economic growth gathers momentum—a factor that usually drives inflation. Japan was the third-largest global market for Amazon.com Inc. in 2016 after the US and Germany, accounting for sales of nearly $11 billion, while some local websites offering cut-rate fashion such as Zozotown are also growing fast. The importance of stable price growth is often lost on consumers who don’t have a nuanced understanding of economics. Below, WSJ explains the critical link between prices and economic growth. Aeon President Motoya Okada said in April that consumer trends, including the low prices offered by internet retailers, left Japan unable to return to inflation after nearly 20 years in which prices have often been in decline. “The end of deflation was a great illusion,” Okada said. Previously, the BOJ and other major central banks blamed low oil prices for the dramatic slide in inflation witnessed since the summer of 2014, when prices peaked at more than $110 a barrel. But oil prices have stabilized recently, and although Japan’s price index edged into positive territory this year, still, the core inflation rate in May—covering all prices except for fresh food—was just 0.4%, suggesting that the central bank was missing something. BOJ officials are finding it difficult to convince Japanese consumers that prices can, in fact, rise. One individual close to the central bank’s policy makers told WSJ that said Amazon was helping to further entrench this view. The BOJ predicted in April that core consumer prices would increase 1.4% in the year ending March 2018, but it is likely to reduce that estimate, said people familiar with its thinking. Some of those people said recent data suggest it will be hard for inflation to reach the 2% target by March 2019 as the BOJ has projected. Another theory gaining ground at the BOJ is that Japanese companies are investing in automation to improve productivity and offset the higher costs of labor and raw materials, allowing them to avoid passing cost increases on to customers. According to Bloomberg, Levent Tok, an Anadolu Agency reporter on the story, said the information about U.S. troop positions wasn’t leaked. “The story was based on field work by Anadolu’s Syria reporters and some of the information on bases had been broadcast on social media by Kurdish fighters”, he told Bloomberg on Wednesday. “The U.S. should have thought about this before it cooperated with a terrorist organization,” he said. “nominal home prices in Canada have grown by 13% over the past year, and by 200% since 2000. These sharp increases in home prices in Canada have invited comparisons with the US housing market in the period leading up to the Global Financial Crisis (Exhibit 1). A large downturn in the Canadian housing market in 2017 would seem particularly untimely given the likelihood of rising mortgage rates in Canada. Most Canadian mortgages have 25-year amortization schedules but 5-year terms, and so borrowers typically have to re-qualify for new mortgages every 5 years. Under our rates view, many Canadian mortgage borrowers may be forced in the coming years to refinance their loans at higher mortgage rates. To frame Goldman’s take, the bank’s housing strategist Marty Young writes that “given the potential risks that a housing downturn could pose to the Canadian economy, we address here the questions (1) “is Canada’s housing market in 2017 comparable to the US’s in 2007?”, and (2) “will rising interest rates lead to significant payment shocks and mortgage defaults among Canadian homeowners?”. Our answer is “in some respects, Canada in 2017 and US in 2007 are similar, but in many respects they are not”. One important difference is with respect to the mortgage lending standards prevailing in the two times and places. Exhibit 2 charts an indicator of US lending standards vs. the US house price index, showing that standards were still loosening during 2005-2007 even as house prices were approaching a peak. In 2006, over 40% of US mortgages were funded via the non-agency RMBS market, where no-doc and low-doc lending and usage of “exotic” loan products such as negatively amortizing adjustable rate mortgages were most common. By comparison, Canadian banking regulators have generally tightened lending standards since the financial crisis, including reducing maximum LTV ratios and amortization terms, and, more recently, Vancouver and Toronto have introduced foreign buyer taxes to dampen house price growth… Canada’s mortgage delinquency rates have remained structurally lower than the delinquency rates in the US for the past several decades (Exhibit 3). These lower delinquency rates reflect a combination of more conservative underwriting and more lender-friendly mortgage foreclosure laws in Canada. The lower baseline mortgage default rates in Canada, combined with stronger bank capitalization, suggest that a house price decline in Canada of the magnitude experienced in the US during 2007-2011 would likely pose smaller systemic risks than were realised in the US during the financial crisis period. Another argument from Goldman: household mortgage debt service ratios remain low. Exhibit 3 shows that delinquency rates in the US had already started trending up by 2007, whereas delinquency rates in Canada remain low, suggesting that Canada’s mortgage market is at least not yet at the same distressed stage as the US’s was in 2007. Similarly, Exhibit 4 shows that the mortgage debt service ratio in US was historically elevated by 2007, whereas the comparable ratio in Canada remains near historically normal levels. Rental vacancy rates and unsold housing inventories are among the other indicators that were already showing stress in the US by 2007, but which still appear healthy in Canada as of 2017. Putting the above together, Goldman says that while a Canadian housing bubble burst would be bad, it would not be quite as bad as what happened in the US a decade ago. Whereas backward-looking indicators of the Canada housing market may still appear relatively benign, market observers have expressed concern that rising interest rates will lead to significant stress, since most Canadian mortgages have only 5-year terms and thus will need to be refinanced at higher rates. Our calculations suggest that this risk, while non-negligible, may not be disastrous. As an example, a borrower who took out a 25-year amortization, 5-year term, 4% mortgage for $300K in 2013 would have been paying a monthly principal plus interest payment of $1,584. If this borrower is forced to refinance the remaining $262K balance in 2018 at a higher 6% rate – a fairly extreme scenario – and takes another 25-year amortization loan, the monthly payment would increase to $1,688, just a 7% increase relative to the original loan payment. The payment increase is relatively modest because (a) the rising interest rate leads to a higher interest payment but also to a smaller monthly principal payment; and (b) the original 2013 loan was scheduled to fully amortize by 2038, but the new 2018 mortgage is not scheduled to pay down until 2043. By extending the final amortization date, the payment shock is partly mitigated. We thus do not expect a large pickup in mortgage defaults due to higher payment burdens among existing borrowers. Goldman tries to spin the reality, suggesting that “In the case of Canada, we expect rising rates to be correlated with a stronger labor market, and thus expect the negative impact on housing affordability to be real but manageable.” That said, this “stronger labor market”, at least in the form of rising wages, has yet to emerge. The recent rapid rise in house prices in Canada presents a risk of eventual over-heating. A model of bust risk that accounts for house price-to-rent ratios, past changes in real house prices, investment-to-GDP ratios, real GDP growth and inflation puts the probability of a 5% or larger downturn in real house prices over the next 5-8 quarters at around 30%. At the same time, we see significant differences between the US housing market in 2007 and the Canadian market in 2017, and for this reason we think it may be early to look for a downturn in Canadian house prices of close to the magnitude seen in the US before the financial crisis. It was not immediately clear if it is “early to look for a downturn” because of Goldman’s infamous, chronic sellside overoptimism about, well, everything (recall the bank had initially forecast US GDP would grow just shy of 3% by the end of 2018, and now a 2% print appears optimistic), or because Goldman needs some more time to put on Canadian housing shorts for its prop group and its best clients. WTI has roller-coastered higher since last week’s ‘bullish’ API report and rose today for the 6th of the last 7 days (on Saudi cut hype). While many eyes are on record high shale production, the recent trend in inventory draws remains key but API upset that dream briefly as Crude saw an unexpected build (+1.628mm vs -3.5mm exp). Gasoline and Distillates saw major draws (much bigger than expected) and Cushing saw its first build in 8 weeks. After API’s surprise crude build, DOE dashed bears’ hopes with a bigger than expected crude draw (-4.727mm vs -3.5mm exp) as the entire energy complex was inventoires decline. WTI prices kneejerked back above $47 on the proint but stalled a little as once again production jumped (to its highest since July 2015). The latest 4.7mmbbl draw dragged down commercial stocks to 491 million, approaching the top end of the historical range. From the start of the year, commercial stocks are up 11 mm bbls, compared to a 38mm bbl increase in 2016, 81mm in 2015 and +29mm in the last 10 years. Meanwhile, total imports rebounded from last week’s 7.6mm bbls to 8.0mm in the latest week. But the biggest highlight of the report, at least according to Bloomberg, is the collapse in Saudi shipments into the U.S., with last week arrivals at a 7-year low of just 524,000 barrels a day, down from 851,000 the previous week. That’s the lowest weekly U.S. imports from Saudi since June 2010. There is no way out of the downward economic spiral for Venezuela in the short run without significantly higher oil prices. “Imagine justifying to your board of directors that you put more money into Venezuela when there was an announcement from the president’s top adviser that he was going to nationalize companies,” Francisco Monaldi, fellow in Latin American energy policy at the Baker Institute at Rice University in Houston, told Reuters in an interview. The US is weighing whether to impose sanctions on Venezuela’s defense minister and several other top officials for human-rights violations, according to Bloomberg, citing officials familiar with the government’s deliberations. They added that the action was one of several under consideration by the Trump administration against President Nicolas Maduro’s government. Despite these and other threats from the US, the country’s embattled leadership remains defiant, vowing to proceed with plans for a controversial new congress despite what it called a “brutal interventionist” threat by Washington to impose economic sanctions, according to Reuters. A vote on whether to create the new Congress is set for July 30 – a vote that is widely expected to succeed. The legislative super-body, known as a Constituent Assembly, would help Maduro rewrite the country’s constitution, ultimately helping him consolidate his authority. As Bloomberg noted, the US Treasury could announce the sanctions, which would freeze the handful officials out of the US financial system, as soon as Tuesday, the people said. Among those named would be Defense Minister Vladimir Padrino Lopez, 54, and Diosdado Cabello, 54, a longtime ally of late President Hugo Chavez and power broker within the ruling Socialist party, they said. The move against top officials – potentially the third round of sanctions against Venezuelans under the Trump administration – are one offshoot of a broader U.S. probe into allegations of Venezuelan corruption that began several years ago and has resulted in some criminal charges. Other Venezuela-related measures are also in the works, the people said, adding that U.S. officials have given briefings on the potential actions in recent weeks to lawmakers including Senator Marco Rubio of Florida. Giving his government’s response, Foreign Minister Samuel Moncada said the July 30 vote for the legislative super-body known as a Constituent Assembly would go ahead anyway, according to Bloomberg. Moncada say it’s “a dark day for U.S.-Venezuela relations” in a televised address. “These are unacceptable threats” Moncada says. Venezuela will “thoroughly” review relations with US, he added. Maduro only narrowly won election in 2013 to replace the late Hugo Chavez. Even Venezuela’s neighbors have voiced their opposition to the legislative body. Emerging-market investors are also worried that the country will soon run out of cash as its foreign-currency reserves have dwindled to $10 billion, begging the question: Will Venezuela repay its debt? Even leadership change wouldn’t be enough to draw some seasoned Latam investors back into the country’s capital markets. Although the fund has no exposure to Venezuela, Robert Koenigsberger says he expects the recovery value on the nation’s bonds to eventually exceed 65 cents on the dollar. He compares it to Peruvian bonds, which traded in the low single digits in 1990, yet eventually were worth 125 cents through a consensual restructuring in 1996. Maduro’s beleagured political opponents have been largely marginalized by his administration, part of the president’s clampdown on dissent amid a worsening economic collapse that has led to widespread famine as well as a breakdown in social order. In the streets of Caracas, the Venezuelan capitol, citizens have begun taking the law into their own hands. As we’ve previously reported, the number of lynchings has risen sharply over the past year. Maduro has also ratcheted up the pressure on the country’s top prosecutor, who has emerged as a top antagonist to his regime Maduro. Maduro’s opponents say they drew 7.5 million people onto the streets at the weekend to vote in a symbolic referendum where 98 percent said they disagreed with the assembly plan. And while many question the ‘unriggedness’ of any former and potential election in Venezuela; wouldn’t this be seen by some as “meddling” in the affairs of another country? We are sure there are Congressional probes being readied right now to question the sanctity of democracy itself as the United States steps in the middle of another LatAm crisis… because they have always worked out so well in the past. Early WEDNESDAY morning USA 10 year bond yield: 2.2767% !!! UP 1 IN POINTS from TUESDAY night in basis points and it is trading JUST BELOW resistance at 2.27-2.32%. The 30 yr bond yield 2.8591, UP 1 IN BASIS POINTS from TUESDAY night. USA dollar index early WEDNESDAY morning: 94.78 UP 18 CENT(S) from TUESDAY’s close. The Dow managed gains on the day (thanks to Boeing and United Health) even with BM eating away half the points (IBM 6.8% drop represents 47 Dow points)…NOTE The Dow was desperately lifted to try to get it unch on the week. Spot The Odd One Out..
General Motors launched it’s much-hyped, all electric Chevy Bolt at the end of 2016. The Bolt was expected to make a splash as it was the first electric car in the U.S. market to offer 200 miles of driving range at an affordable price starting around $35,000. The only problem is that pretty much no one seems to want one. Unfortunately, that lack of demand is about to earn a bunch of UAW workers at GM’s Orion, Michigan plant an extended summer vacation. As AOL Finance points out today, GM has managed to sell just over 7,500 Chevy Bolts through the first six months of 2017. Moreover, since dealers are sitting on about 111 days worth of inventory, we’re going to go out on a limb and say the Bolt launch slightly underperformed expectations. All of which has resulted in GM’s decision to extend the shutdown currently in effect at it’s Orion plant for just a little while longer. General Motors Co has extended a shutdown at the Michigan factory that builds the new Chevrolet Bolt electric car as part of a broader effort to get control of bulging inventories of unsold vehicles in the United States. “Shutdown periods vary by plant based on launch timing of new or refreshed models across the portfolio and our ongoing efforts to align production with market demand,” GM said in a statement. But it’s not just the Chevy Bolt that GM is having a hard time selling. Overall, the company is battling a massive inventory glut, some 126 days of supplies, in passenger cars. As such, the company has extended summer vacation shutdowns at three other North American assembly plants. The assembly plant at Lordstown, Ohio, that makes the Chevrolet Cruze and a plant near Kansas City, Missouri, that produces the Malibu sedan both have three additional weeks of downtime. An assembly plant in Oshawa, Ontario, will be idled for two extra weeks to reduce inventories of the Chevrolet Impala large sedan. Of course, this shouldn’t be much of a surprise for our readers as we recently pointed out that GM’s “channel stuffing” hit a new all time high for the restructured company in June 2017, with the number of GM vehicles parked at dealer lots and patiently waiting for a buyer rising to the highest since the summer before recession officially began, when GM was still pre-bankruptcy GM, with far greater (if ultimately superfluous and in need of restructuring) production. All of which kind of makes you wonder just how well that other, highly-anticipated, mass-produced, affordable, all-electric vehicle will perform when/if it officially starts to ship later this year. Last quarter, IBM almost fooled the market when it “beat” but only thanks to using the lowest (until then) effective non-GAAP tax rate in recent history (excluding one charge-filled quarter when the rate was negative and thus N/M). IBM’s reported GAAP and operating (non-GAAP) tax rates of 4.5 percent and 9.2 percent, respectively, include the effect of discrete tax benefits in the quarter, which contributed $0.18 to the company’s earnings per share. At this rate IBM will soon need a negative non-GAAP tax rate to make its negative non-GAAP earnings turn positive. The company continues to expect a full-year ongoing effective operating (non-GAAP) tax rate of 15 percent plus or minus 3 points, excluding discrete items. … but this was also the 21st consecutive quarter of declining revenues for the company which lately can’t seem to get any traction on the top line. Revenue in IBM’s technology services and cloud platforms business — its largest — fell 5.1% to $8.41 billion, below consensus expectations of $8.58 billion. Total revenue was down 4.7%, the steepest fall in five quarters. IBM has not posted growth in annual revenue since 2011. Away from the top and bottom line, IBM reported that in Q1 it generated net cash from operating activities of $3.5 billion, and free cash flow of $2.6 billion. What is amusing is that IBM returned more than all the cash it generated to shareholders in the form of $1.4 billion in dividends and $1.4 billion of gross share repurchases. At the end of June 30, IBM had $2.4 billion remaining in the current share repurchase authorization, which means that in two more quarter IBM will have to authorize another $5BN or so in stock buybacks. IBM ended the second quarter with $12.3 billion in cash, an increase of $1.6 billion from Q1. And since it burned more cash than it generated, debt logically swelled to $45.7 billion, up from $42.8 billion in Q1 and from $42.2 billion at the end of 2016. The stock, just like last quarter, appears to have grown wise to IBM’s endless non-GAAP/tax shenanigans and is down 2% after hours. Those days are long gone. As birth rates plummet and people live longer, (which otherwise should be considered a positive development) social security’s future is looking more and more bleak. No matter how you slice it, it doesn’t seem possible to keep social security funded. In fact, social security is going to start paying out more money than it receives in just a few short years. It may even be insolvent before the baby boomer generation dies off. According to the Social Security Board of Trustees, the Old-Age and Survivors Insurance, and Disability Insurance (OASDI) Trust Funds will be depleted in 2034. When this happens, only 77 percent of benefits will be payable. That estimate is no change from last year’s estimate. In addition, the Disability Insurance trust fund will be depleted in 2028, which is an improvement from last year’s estimate of 2023. Once that fund is depleted, 93 percent of benefits will be paid. Right now, Social Security continues to take in through revenue more than it pays it through benefits, which is expected to continue until 2022. Once Social Security begins to pay out more than it takes in, it will be forced to liquidate the assets held by the trust funds. In 2016, Social Security generated $957 billion in income. It only paid out $922 billion including $911 billion in benefits to 61 million beneficiaries. But the solutions that have been proposed for this problem don’t hold much promise. For instance, we know that simply raising taxes won’t work. But increasing the payroll tax is not a good long-term solution to fixing Social Security. For example a higher payroll tax would have negative economic effects. In addition, it’s not even clear that raising the payroll tax would even generate enough revenue. This is one reason why so many Western countries, almost all of which are suffering from declining birth rates, have been so eager to open their borders to more immigrants. They’re trying to bring in as many young workers as they can. But that’s not going to work either. Forget about the high crime rates, terrorist attacks, and social disintegration that Europe is facing now after bringing in millions of immigrants. Even if those problems didn’t exist, immigration isn’t the solution. The West has had wide open borders for decades, and it hasn’t made a dent in the liabilities faced by social security programs (perhaps these immigrants aren’t paying as many taxes as these governments had hoped). We could let younger generations opt out of social security to stave off future obligations, but that wouldn’t help fund the current generation of retirees. Social security is already on the path to being underfunded for them, and letting young people opt out would obviously make things worst for current retirees. There isn’t really any viable solution for paying off the future liabilities of social security, aside from cutting the benefits or increasing the retirement age. Otherwise it’s going to run out of money eventually, which is the same story with private and public pensions. We are all paying for our retirements in one form or another, but few of us living right now are going to fully benefit from it. A clearly frustrated President Trump lambasted GOP senators at The White House this morning demanding that they cancel their August recess and not leave town until acting to repeal ObamaCare. “We can repeal, but we should repeal and replace, and we shouldn’t leave town until this is complete — until this bill is on my desk,” the president told senators at the beginning of a lunch meeting at the White House. “Any senator who votes against debate says you are fine with Obamacare,” Trump said. As Bloomberg reports, The Senate was originally scheduled to go on its traditional August recess on July 29, but McConnell delayed it by two weeks. The inability to deliver on seven years of GOP promises to repeal and replace the Affordable Care Act would be the biggest failure yet for Trump and Republicans since they won control of Congress and the White House. “I’m not going to own it,” Trump told reporters at the White House on Tuesday. “Since 2013 Obamacare premiums have skyrocketed… Despite the promise that premiums would decrease by $2,500 on average, they’ve almost increased by $3,000 and even much more than that in some cases. It’s crushing the Middle Class and the families of the Middle Class. It’s frankly crushing our country. The CBO states that the government has until mid October to raise the debt ceiling. US default risk has flatllined for weeks, market risk has leaked to record lows, and Treasury Bills have ‘behaved’… until now. The last two days have seen a sudden aggressive spike in the yields of T-Bills around mid-October, inverting the yirld curve as debt-ceiling anxiety starts to build quietly away from NFLX and AMZN shares. For now there is no perturbation in the VIX curve for the same period. This move should not be a total surprise to readers as the CBO warned recently that Treasury will run out of cash in mid-October. With Trump tax reform far on the backburner, the CBO reminded that in just 3 months a more material threat is facing the US: according to the latest CBO calculations, the Treasury will “most likely” run out of cash in early to mid-October, unless the most polarized Congress in history raises the debt ceiling. This is what the CBO just said in its latest report on the “Federal Debt and the Statutory Limit”, released moments ago. If the debt limit is not increased above the amount that was established on March 16, 2017, the Treasury will not be authorized to issue additional debt that increases the amount outstanding. (It will be able to issue additional debt only in the amount of maturing debt or the amounts cleared by taking extraordinary measures.) That restriction would ultimately lead to delays of payments for government programs and activities, a default on the government’s debt obligations, or both. CBO estimates that without an increase in the debt limit, the Treasury, by using all available extraordinary measures, would most likely be able to continue borrowing and have sufficient cash to make its usual payments until early to mid-October of this year. In recent weeks, Treasury Secretary Mnuchin has urged Congress to lift the debt limit before its August recess (with others calling to abolish it altogether) although he also conceded that the nation can likely pay its bills if action waited until September, which is all lawmakers needed to know they don’t have to rush until the very last minute. He has also warned that the closer the U.S. gets to breaching the debt ceiling in mid-October, the more likely financial markets are to react unfavorably, although that warning appears to have been negated by his first one. On Thursday following the release of the CBO report, he again urged Congress to take action. “For the benefit of everybody, the sooner that they do this the better,” he said at a White House briefing, although he once again diluted his case by adding that “we have contingency plans” if Congress doesn’t raise debt ceiling by a certain date, so the market “shouldn’t be concerned.” Which is all the market needed to know to keep rising until some time in early October, when it freaks out again. Furthermore, as Cowen’s Chris Krueger wrote today, a government shutdown is now more likely than tax relief. Cowen doesn’t agree with conventional wisdom that tax changes are now easier because GOP self-preservation will kick in, and no longer has tax cuts next year in its base case. Two-week October shutdown now part of base case;recalls Donald Trump’s animosity about media reporting on “bad” April govt funding deal and Democratic cheering; expects much tougher White House negotiating perspective on core issues, including Mexico border wall, Planned Parenthood, EPA and defense spending. Health care may reappear post-Labor Day, with expiration of 5-year funding authorization of SCHIP program for children, pregnant women on Sept. 30; may become vehicle for some type of ObamaCare repair operation.